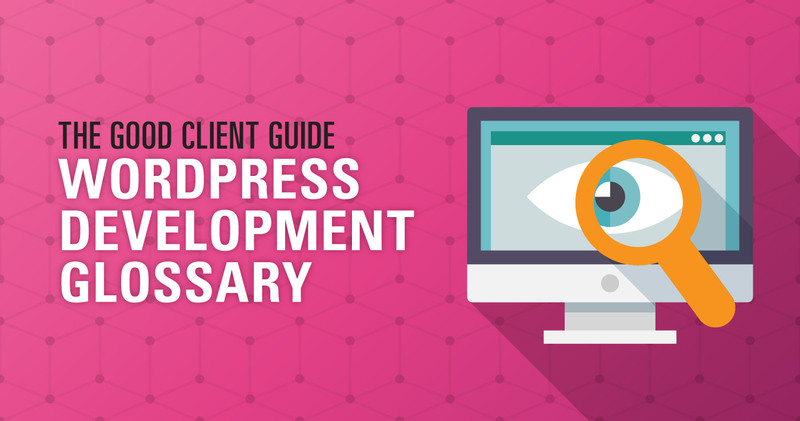 Part of a series exploring WordPress web development from a client perspective, this is a reference guide for confusing terminology you might hear during each phase of the process. This post is part of an ongoing Good Client Guide series, which serves to demystify the web development process and empower consumers of web design (known to many in the industry as The Client™) to be an informed and effective partner in the process. The process of getting a website developed for your business is exciting. You’ve found someone to work with who fits your timing and budget, but more importantly seems to match the level of enthusiasm you have for solving your problem. They are working hard to provide you with a solution that fits your business needs and those of your audience, and you want to give them the information and support they need to succeed. After all, their success is your success too! The terminology of web development can seem like a whole other language. Even if your developer or designer is doing their best not to fill their speech with acronyms and jargon, there are still plenty of words you are going to encounter when having a conversation about your site. Words common to web design, web development, and WordPress specifically, some of which you may have seen before but not understand, and some which are completely foreign. I feel that it’s really important to have a well-defined shared vocabulary to improve collaboration with your designer or developer, so I’ve put together a WordPress Glossary of some of the most common words you might hear during this process. A note to my fellow designers and developers: some explanations here, while broadly true, may not be technically correct in every specific circumstance. I tried to explain things as an abstract concept, rather than all the technical specifications powering them. That being said, if something seems completely off base or you’ve found a different way to explain a concept, feel free to let me know what you think and I can rework a definition. Did I miss anything? Is there something you want to add? Was there a particular word or term that you struggled to understand (or explain) when you were working on a web project? Let me know in the comments! Ready to get started? Step 1: What To Do Before Your Project will help you do your due diligence before your project begins so you can start smoothly! You forgot “widget.” Clients ask me about that one all the time. Good point, I should add that! Thanks for the guide,very useful specially for WordPress beginners.I am trying to build a website using WordPress so this is really helpful guide.